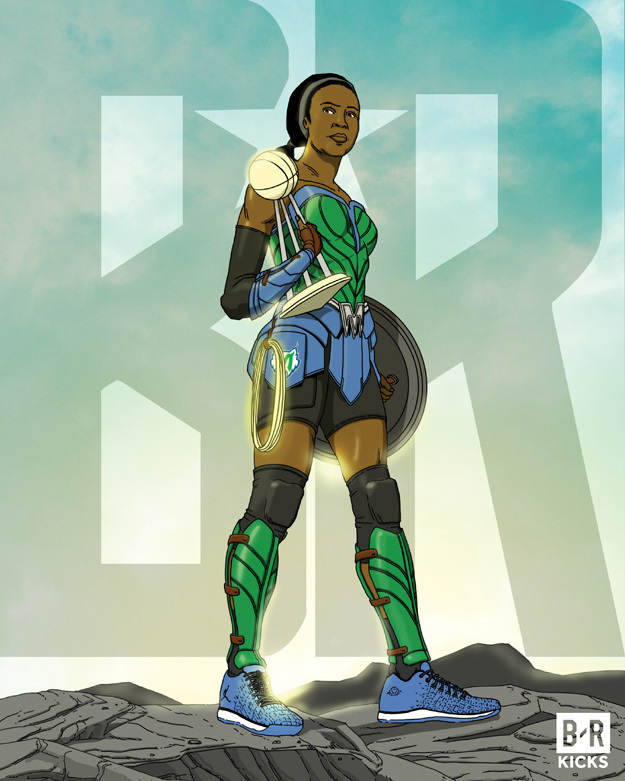 Here’s my illustration of the Wonder Woman / Maya Moore mashup. It was inspired by the Wonder Woman Justice League movie poster. I affectionately referred to this piece as “Wonder Moore”. She’s wearing the Nike Air Jordan 31 “Royal” colorway. The outfit’s color scheme is based on the Lynx’s light blue, green, and silver colors. Her hair is in a headband and tied-up in a ponytail like she has in games. She’s wearing arm and leg sleeves like she does in games. The Lynx logo is along the side of her skirt. She’s holding the WNBA Championship trophy.